Sitting down for lunch during a relatively calm part of the whiteout. What a blast! The dogs have bravely blazed their way over hills, across waterways, and through difficult weather - making it to Baker Lake in less than 10 days! Its been some exciting travel filled with different landscapes, more harsh weather, and interesting animals. Most recently, we have seen 5 snow hares, tracks of a wolverine, an arctic fox, groups of ptarmigan, and 30 to 40 caribou. Its very likely that we crossed paths with even more caribou, we just couldn’t see them, but the dogs definitely acted like they were around. The dogs accelerate for no apparent reason; however, its obvious they must smell or hear the caribou and want to give chase. For four days, the wind was blowing in very hard from the east, kicking up snow and leaving us in what is best described as whiteout. A whiteout is like a blizzard, but it doesn’t necessarily have to be snowing. Often times, a whiteout is just blowing snow. The sky and the ground become one and it is very easy to lose a sense of direction. We also experience a slight vertigo which makes it difficult to determine up and down. The light is so “flat" that it is almost impossible to see the contours of the land right in front of us and we have a hard time distinguishing the ground or snow drifts. We stumble around not able to judge bumps and unable to keep track of the direction we are traveling. At times, rocks and hills were distinguishable a short distance ahead; other times, the outline of a lead dog was the only discernible thing. Our only saving grace is the wind and its constant blowing from the east, but we also had three things going for us. Cola did an incredible job leading following an endless stream of commands... Gee (right) Cola, Chaw (left) Cola. Luckily, it was not very cold and the wind was at our side and backs. Had we been traveling on the coast of Hudson Bay toward Chesterfield Inlet as originally planned, the wind would have been straight in our face. Finally, we had our GPS, (global positioning system) without which, it would be impossible to travel on the whiteout days. Our travel went something like this: we would take a bearing with our map and compass, travel a couple of miles (usually less), check the terrain and determine if we were on land or lake ice, and then check our position. It is very tedious and stressful work because we are constantly checking our bearings. 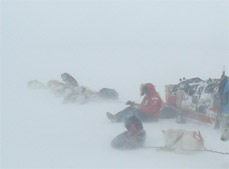 Each time we check our route we feel good as the sleds and dogs are progressing in the right direction. Besides facing the extreme difficulty in navigation, our other major challenge is to stay together. Its not nearly as easy as it sounds. First of all, the following or “chase” team has to leave enough space for the lead team to pause, make decisions, and choose a route. If the chase team gets too close, the dogs can distract the lead team. The chase team has to balance keeping a “safe” distance and being close enough to be able to see the trail. At one point Mille, was out ahead with Aksel in lead, just having passed through a field of rocks. Then going around a bend, she thought Paul was right behind and continued further ahead; however, Paul’s sled got hung up on a big rock and within a few minutes even the slight trace of Mille’s sled trail had almost completely disappeared. 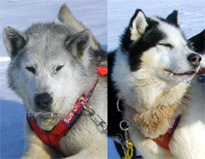 Mille realized the teams were getting separated, stopped the sled, and immediately looked at the clock to check the time (a few minutes can seem like hours in a situation like that). She realized that it would be almost impossible for Paul to find her unless he could somehow hear her, so she started to howl and got the dogs howling and barking. This way Paul would be able to locate her team in the midst of the approaching storm. Six minutes later she could hear Paul’s voice calling out commands to Choko as he found the trail and Mille. 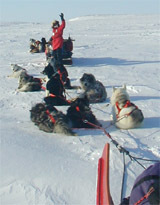 Paul is raising his hand as a signal to start mushing. That was the beginning of the whiteout. From that point on, we stayed very very close and constantly checked on each other. The key in this situation is communication. It is difficult though, as we can barely talk even when standing right next to each other because the wind is so loud. Its like our words get blown away as soon as they leave our mouths. In situations like this, we use arm signals. Two arms up in the air means "stop." One means "ready to go," which has to be answered by an arm in the air. An arm waiving forward means "continue" when on the back sled. When it is the person on the front sled waiving the arm forward, it means "bring your sled all the way up" or "pass me." Now, how the dogs understand us is truly mind boggling, especially when keeping in mind the only control you have over a dog team is by using language. We have our voice commands, gee (right), chaw (left), straight ahead, on by, yip or hop, and woaaaa (stop). But what is truly amazing, is that they can read and react to our body language. The dogs seem to be able to interpret exactly how we are feeling. When one of us is mushing out in lead, they demand our constant attention. We need to be focused on the trail ahead and the dogs, if for a few minutes our thoughts slide somewhere else, they start looking back with faces that seem to say, "hey, are you paying attention to what you're doing back there?" Their ability to interpret our emotions constantly amazes us. The dogs sense if we are concerned, sad, or mad. If we are happy - they are happy, without us ever saying a word. They discern all our feelings and thoughts disguised behind all the layers of our clothing. The dogs are very observant. They simply read our body language. They notice little things: how we walk, hand movements, tone of voice, or body posture. Our Polar Husky stars of the week, Timber and Peto. After a little bit of careful observation, dog language is pretty straight forward. Spank's role as the boss dog (alpha male) comes across pretty clear! Even a poodle can understand that one. Now, human language is much more complicated. Some body language, like a handshake, seems fairly universal, though it probably is not native to all cultures. Think about that.. Does your culture have any unique body language? One type of traditional Inuit "kissing" somebody is by touching noses, whereas in Minnesota where Paul is from, its a little different (I’ll let you fill in the details). Inuit also traditionally communicate by using hand and face gestures. As you might know by now, we are working on learning as much Inuktitut (Inuit language) we can as we go along. Not only would we like to be able to talk to all the elders without somebody translating, but we want to fully respect the culture in which we are traveling. Mille's native language is Danish. In Denmark, people have to learn two foreign languages, the second being English. Many often choose to learn a third language as well. That means you start learning English in 4th grade, and in Mille’s case, German in 5th grade. Besides learning those languages, Danish students have to be able to understand and read their "sister languages" Swedish and Norwegian. Today, Mille’s everyday language is English, or maybe more correctly, American as we live in the US, but sometimes waking up early in the morning, be really tired at night, or very scared and needing help make the words come out in Danish. Mille comments, “If I have a dream related to Denmark, I dream in Danish, even though most the time I think in English when not in Denmark. It is really cool to learn another language because it makes you realize it is possible for you to learn any language. But it is equally important to learn about and understand the basics of the foreign culture in order to learn the language.” An Inuktitut example of how the language reflects its culture is the fact that no word exists for “wilderness” and there are more than 30 variations of the word snow (one word for snow is "apuq")! Caribou materialize from "nowhere" during a reprieve in the whiteout.